Any applications received that are not selected for current openings will be held for future openings. At the end of 2019 we will be staffing another location full time. Application period open until all positions are filled. Part time civilian position, to perform routine maintenance and minor repairs to our fleet of fire apparatus, support vehicle and small equipment to include mowers, chain saws, leaf blowers and portable pumps. Must have prior experience as a heavy truck mechanic, diesel and gasoline engines, hydraulic and air brake systems, manual and automatic transmission. Flexible hours, pay consummate with experience. Part time civilian position, to perform maintenance and repairs to buildings and fixed facilities of the Gravois Fire Protection District. Must have experience in building repair, construction, electrical, plumbing and HVAC. Base starting rate $11.07 per hour and upon successful completion of 1-year probation $11.57 per hour. Approximate annual salary without incentives and overtime or holiday pay is $32163.00-$32594.00 dependent on shift assignment and rotation schedule. The entire benefit package includes: raises annually at anniversary date after successful completion of probation; training incentives; retirement, LAGERS L3, rule of 80, 50% district funded buy out of prior service, 5 year FAS with 4% employee contribution; a 457 plan; Health insurance, 100% of employee by District, dependent coverage at employees expense; Workmen’s Compensation Insurance by District; Life Insurance of $50,000.00 by district; employee assistance program; membership with The Firefighters Association of Missouri with $10,000.00 accidental death insurance by District; Supplemental Accidental Death, Injury, Illness and Impairment Benefit Plan by District; individual Supplemental Benefit Insurance plans available at employees expense through payroll deduction; Sick Leave, Paid Vacations; Holiday pay at 1 1/2 time if scheduled to work on established holidays; Emergency Leave; Funeral Leave; provisions for shift trades; Compensation for working additional shifts, call backs, recalls and required off duty training paid through compensatory time; Uniforms, both work and dress including coats, boots, shoes and belts provided; Protective Clothing for structural firefighting, rescue and wildland firefighting provided; infective disease control materials provided; handheld radio and stored voice pager for each firefighter. Training provided in-house under the supervision of certified instructors along with area and regional classes available. Indirect benefits include; in-house laundry facilities for uniforms and protective clothing provided, basic bedding and linen provided, work out area and equipment provided. 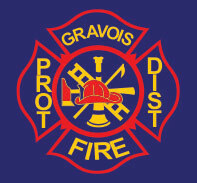 The Gravois Fire Protection District has voluntarily withdrawn from the Tri State Fire Recruitment Alliance and in the future will be conducting pre-employment testing on-site. The District reserves the right to consider otherwise qualified candidates who may not possess all prerequisites and if selected would be hired at a lower rate and time frame given to obtain missing requirement. Clean driving record; no more that 3 minor violations in past 3 years and not more than one in the preceding 12 months. No major violations during past 3 years, with any multiple major violation you must have a clean record for the past 5 years. Minor violations include: speeding less that 15 mph over the posted limit; driving too fast for conditions, unsafe lane change, failure to stop or yield right of way; following too closely; driving too fast for conditions. Major violations include: driving with in-valid license; driving under the influence of alcohol or drugs; possess of alcoholic beverages; reckless/careless/negligent driving; suspended or revoked license; leaving the scene of an accident (hit & run, failure to report); speeding conviction of 15 mph or more over the posted limit; gross negligence, manslaughter, homicide or any felony arising out of the operation of a motor vehicle; fleeing a police officer; street racing. NIMS IS 100 & 700 minimum. For application to be considered it must include a resume, copies of required certification/licensure, CPR card and copy of valid drivers license. Also, include any other copies of certificates from fire or rescue related training classes or other relevant certifications.